This article has been reproduced with the kind permission of Mattress Advisor. You can find the original article here. 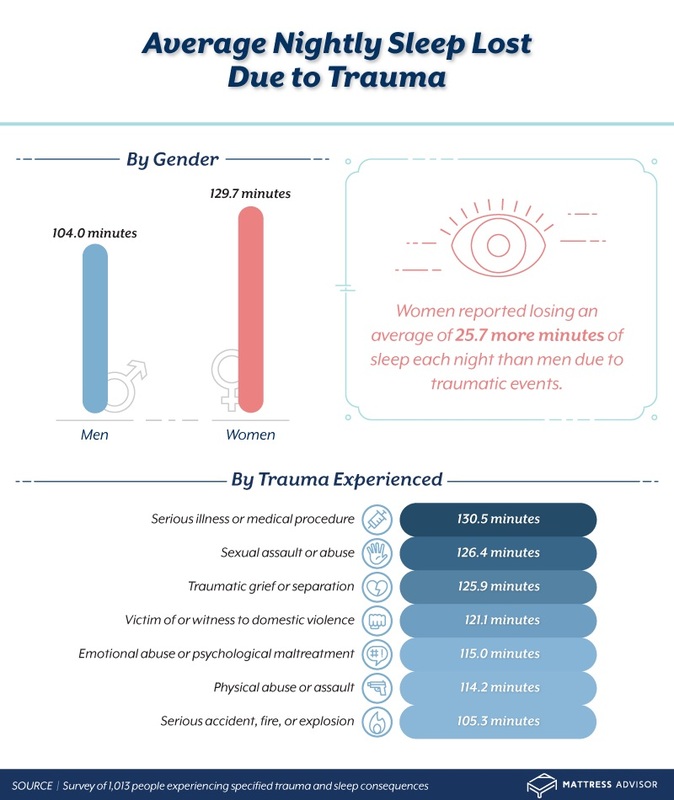 To better understand the relationship between traumatic events and sleep, we surveyed over 1,000 people who reported experiencing a traumatic life event that negatively impacted their sleep. Seeing as the definition of trauma is very broad, we narrowed the qualifying experiences down to the most commonly reported in a preliminary survey: traumatic grief or separation; emotional abuse or psychological maltreatment; a serious accident, fire, or explosion; bullying; physical abuse or assault; serious illness or medical procedure; sexual assault or abuse; and a victim of or witness to domestic violence. Keep reading to learn more. Despite little being known about why we sleep, scientists have figured out exactly how much sleep we need to stay healthy. Adults require seven to nine hours of sleep every night, with anything less than seven negatively impacting health. But quality sleep can be hard to come by, especially when stress and anxiety levels are high. For those who experience trauma, their quantity and quality of sleep are often diminished. On average, women who experienced one of the traumatic events studied reported losing an average of 129.7 minutes of sleep each night, nearly half an hour more than their male counterparts. Respondents who reported experiencing a serious illness or medical procedure reported losing an average of 130.5 minutes of sleep, followed by 126.4 minutes lost by those who experienced sexual assault or abuse. Considering the average American only sleeps 6.8 hours each night, losing two hours of sleep due to traumatic events likely means those affected are getting significantly less than the recommended amount of sleep. Consistent sleep loss can lead to sleep deprivation, adding to the symptoms people may already be experiencing from the traumatic events themselves. Lack of sleep not only leaves you extra drowsy during the day but also can cause overall fatigue, irritability, depressed mood, cognitive deficits, and various physical changes. A single night of sleep loss can lead to negative effects the next day, but for those who have experienced trauma, sleep loss is most likely to last for months. Around 34 percent of both men and women reported losing sleep for months after experiencing trauma compared to 10 percent of men and less than 5 percent of women who reported losing sleep for mere days. There also was a significant difference in the resolution between the genders. Nearly 25 percent of women said their sleep problems continued to be unresolved, while only 14 percent of men said the same. Female victims of or witnesses to domestic violence reported losing sleep for the longest amount of time – averaging over two years (30.8 months) of sleep problems. Female sexual assault or abuse survivors also neared the two-year mark for loss of sleep, averaging 21.7 months. Experiencing a traumatic event often leads to the development of acute stress disorder and post-traumatic stress disorder, with many symptoms involving sleep disturbance. Not only do traumatic events and PTSD cause anxiety and depression symptoms to increase but also many victims experience insomnia, or difficulty falling asleep, and nightmares – both of which have a significantly negative impact on the quality and amount of sleep one even manages to get. After experiencing a traumatic event, sleep can suffer in a variety of ways. We asked our respondents about the type of sleeping disorder or interfering symptoms that keep them up at night. Nearly 80 percent of respondents reported suffering from insomnia, a common condition that can have serious consequences for physical and mental health. Having difficulty falling or staying asleep for a long period increases the risk of stroke, seizures, obesity, heart disease, mental health disorders, and even shortens life expectancy. Almost half of those with sleep problems reported trying to alleviate them. The majority (70 percent) turned to sleep aid medications, but it was only effective for 57 percent of those who tried it. Although only 35 percent tried medications other than sleep aids, 61 percent found the method to be effective. Cognitive behavioral therapy was rated the most effective method of treating sleep problems, but it was also the least undertaken. While there are numerous treatments and sleep aids that can help combat insomnia, when insomnia is a symptom of a bigger problem, it’s better to treat the root cause. Otherwise, relief is only temporary. Your sleeping environment can have a big impact on your quality and duration of sleep. For those who don’t have chronic insomnia, there are environmental changes that can lead to a better night’s sleep. Here are some of the activities respondents engage in to help get some much-needed shut-eye. Around 30 percent of respondents changed the position or arrangement of their furniture, and 27 percent installed blackout curtains. Thirty-six percent tried sleeping with the TV on, a change that may do more harm than good. While some background noise may help people fall asleep faster, the blue light and changes in brightness and volume that occur while the TV is on can impact the quality of sleep. Sleeping with the TV on can keep you in the lighter stages of the sleep cycle, preventing your body from experiencing the stages where memories are consolidated and restorative work is done. Background noise that has been proven to help sleep, however, also happens to be the method most tried. Forty-three percent of respondents tried playing white noise to help them sleep, an evidence-based method that has been proven to work. White noise is very bland and not much fun to listen to, but that is exactly why it aids sleep. Loud noises and changes in volume, like those from TVs, can easily alert the brain to wake up. When white noise is playing in the background, though, other noises are drowned out by the monotone sound, preventing you from being roused from slumber. Everybody is different and what works for one may not work for another. But when people have shared experiences, even if the details differ, there are certain pieces of advice worth following. Many of the people surveyed advised that fellow sufferers reach out and get help. Seeking out a professional for treatment is nothing to be ashamed of. It’s important to fight the stigma, and remember you are not alone. Reaching out and seeking help can be life-saving. Getting a good night’s rest can seem impossible when recurring thoughts keep you from drifting off, and nightmares wake you up, but there is help out there. Don’t be afraid to reach out and ask for a helping hand because you’re not alone. The sleep you’re missing out on can have detrimental effects to both your mental and physical health and can prolong the underlying problem. If a change in environment is the method you want to try next, it may be time to look at your mattress. A good mattress is key for a quality night’s rest, and at Mattress Advisor, we’re here to help. No need to worry about picking the perfect mattress yourself; just take our Mattress Finder Quiz and let the experts do the work. We surveyed 1,013 people using Amazon’s Mechanical Turk. 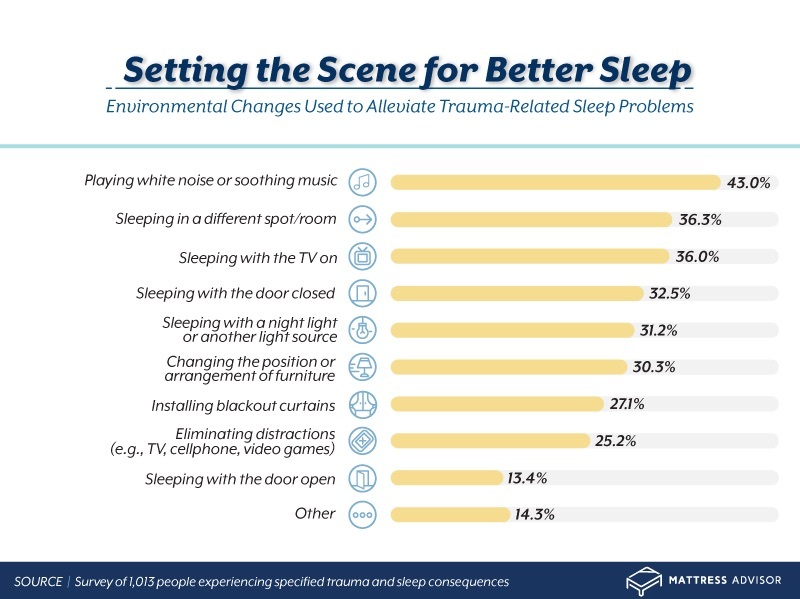 Respondents had to report they’d experienced a traumatic event that negatively impacted their sleep to qualify for the survey. For this study, we looked at a specific set of traumatic events. We used the types of trauma and violence categories from the Substance Abuse and Mental Health Services Administration and ran a preliminary survey. 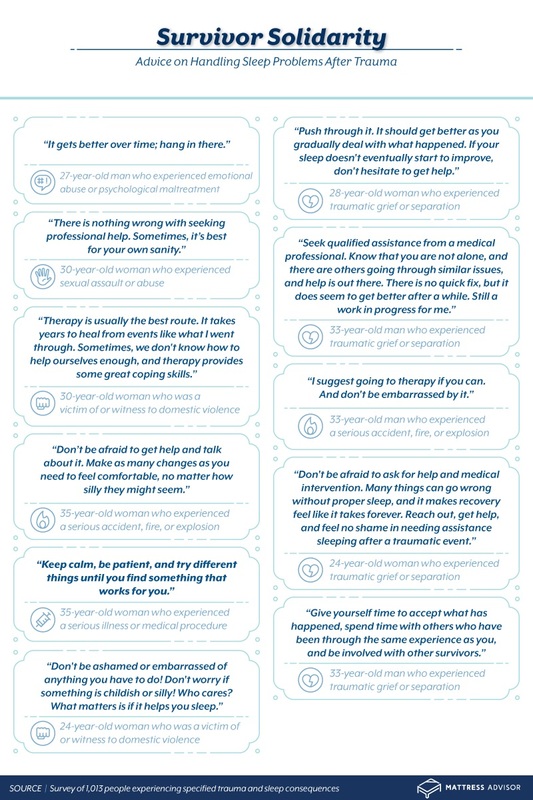 The final list of traumas we decided to explore in this project was determined based on the results of the preliminary survey. If a survey participant did not select one of the traumas presented in this project, they were disqualified from the survey. Neglect and bullying were also traumas included in our study. However, due to low sample sizes for these traumas, they were excluded from our visualization of the data. Respondents were 61.8 percent women and 38.2 percent men. The average age of respondents was 36.5 with a standard deviation of 11.1. All averages included throughout this project were calculated to exclude outliers in the data. This was done by finding the initial average and standard deviation of the data. Then, we multiplied the standard deviation by two and added that amount to the initial average. Any data points above that sum were then excluded. 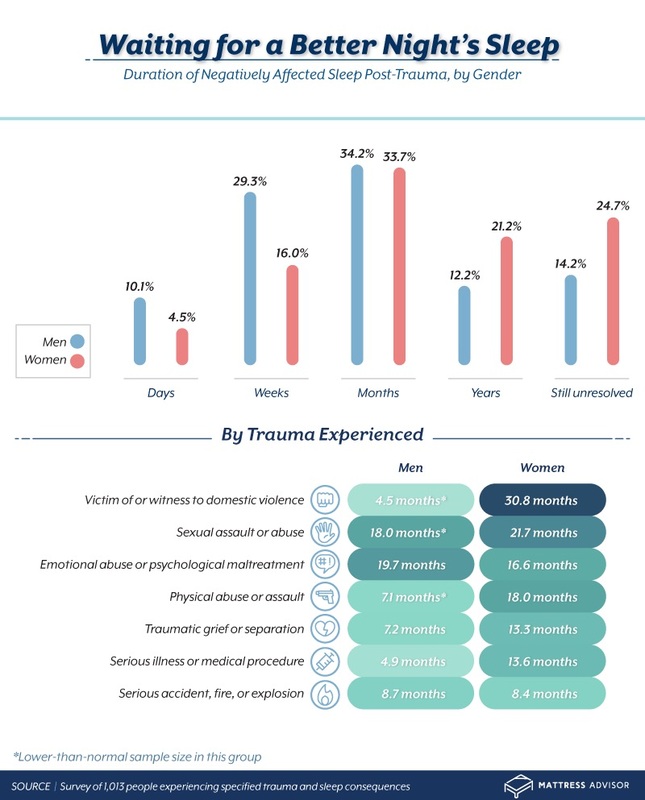 In parts of this project, the averages for the number of months of negatively affected sleep after trauma are broken down by gender and trauma experienced. It should be noted that some of the groups had lower sample sizes than normal. These have been marked in the study. Sleep problems occurring after trauma are discussed in this project. In addition to the options included here, respondents were also given the option of reporting dreams as a sleep consequence after trauma. This was excluded from the final visualization of the data. The parts of this project that deal with methods and environmental changes used to alleviate trauma-related sleep problems are based on the people who reported using them. For example, respondents had to first report that they tried methods or environmental changes to treat their sleep problems before answering questions about specific methods and changes. 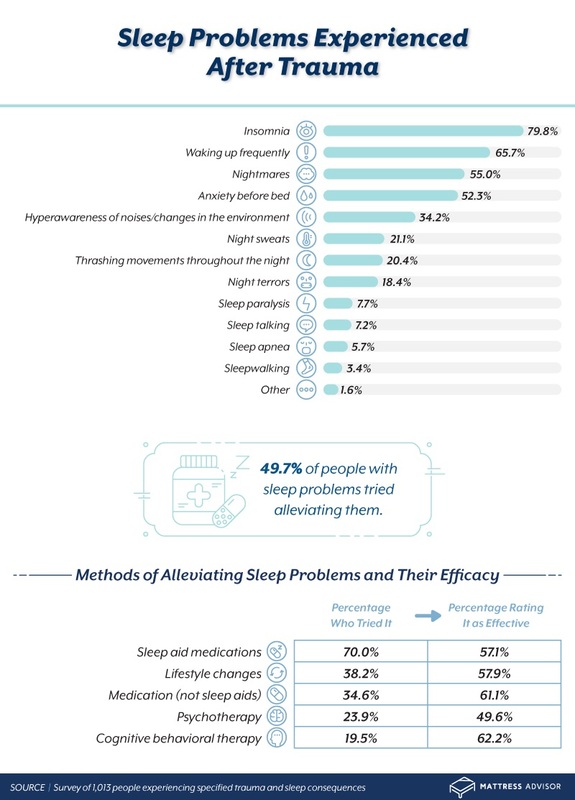 Of all respondents, 49.7 percent reported using methods to alleviate their sleep problems. In terms of environmental changes, 31.2 percent of respondents reported employing them to improve their sleep. We all face difficult experiences in our lives. Every type of trauma impacts us in many ways, and that can often include how long and how well we sleep. If someone you know is struggling or you want to start a conversation about mental health, you are free to share this study. If you choose to do so, please link back to here so that people have the chance to review the entire project and its methodology. This article was written for Mattress Adivisor and we have been given permission to reproduce the article for our website. We have made a small edit to the original, removing two paragraphs concerning mental illness. Thank you to Mattress Advisor and the author for allowing us to share this research and information on our website. Increasing mental well-being begins by understanding what it means to those who need to increase it. Jane Fisher discusses increasing mental well-being begins by understanding what it means to those who need to increase it. Working to effectively understand not just the needs of those who hear voices but understand the community they live in on a day-to-day basis is a great start. Last year, there were 66,620 people with physical or sensory disabilities registered in Wales. Of these, not all had adequate access to mental health care or physical spaces in which they felt comfortable expressing their needs, especially regarding psychiatric care. Increasing accessibility to mental health services is only one challenge. Other challenges include accessibility features that cater specifically to the needs of those who hear voices so that they can successfully participate in Welsh society and workplaces. A study conducted regarding what those living with the diagnosis of schizophrenia need to increase their well-being found that taking part in social contacts such as attending meetings at work and receiving home visits from medical professionals or loved ones was incredibly important. Engaging in secure professional relationships was deemed incredibly important in allowing the subjects in the study to integrate into society in a way that made them feel positive and increased their mental well-being. This begs the question of what medical professionals and Welsh society can do to cater to these needs. Because professional interactions were so important, these changes can begin in the workplace. Smart technology isn’t just for making your life at home easier. It’s being integrated into workplaces all over the world in an effort to increase productivity as well as accessibility. Research released recently shows that wearable technology can be helpful for people with mood disorders or who live on the schizophrenia spectrum. The technology included in these devices can monitor things such as levels of mental attention. Non-gelled electroencephalogram and electrodes can be processed to assess the attention level of a person and that data can be used to help them understand how to increase their mental and social awareness in situations like one might encounter in the workplace. The ability to monitor social interaction and possibly, in the future, brain activity are other noted benefits of wearable smart technology in terms of accessibility. What’s great about smart technology is that it provides mental health professional with a treasure trove of data regarding the behaviours and needs of people all over Wales. This data can not only be used to understand what is needed to increase mental well-being but also used to understand why, when, how, and where certain schizophrenic episodes take place. That kind of data is invaluable in a community like Wales where it’s generally hard to access the resources needed to engage in comprehensive studies that yield actionable results. Increasing mental well-being begins by understanding what it means to those who need to increase it. Working to effectively understand not just the needs of those who hear voices but understand the community they live in on a day-to-day basis is a great start. With the help of smart technology and the data it can collect, mental health professionals in Wales can begin to increase access to proper health care and develop higher-level solutions. Professor Tony Attwood believes the “out of the box” thought processes of people on the autism spectrum will solve the world’s big problems. He is credited with being the first clinical psychologist to present Asperger’s syndrome not as something to be “fixed ” but as a gift, evidenced in many of the great inventors and artists throughout history. Professor Attwood is highly regarded for his ability to connect with and bring out the talents of people with Asperger’s. He describes himself as a translator between the “neurotypical” and Asperger’s worlds. “Whether it’s a news story or television drama, human violence appals and fascinates in equal measure. Yet few of us choose to dwell on what preoccupies the mind of a perpetrator for long. Professor Gwen Adshead, however, thinks about little else. As a Forensic Psychotherapist, she works with some of the most vilified and rejected members of society. They are the violent offenders who are detained in prisons and in secure NHS hospitals, like Broadmoor, whose actions have been linked to their mental illness. Having a clean, tidy home helps you feel more organised, relaxed and can indirectly help the one in ten people living with voices. People living with diagnoses such as schizophrenia and people hearing voices have been shown to benefit from a relaxing environment and techniques, according to mental health charity, Mind UK and Rufus May. Recently, there has been much said about the link and importance of mental health in the workplace environment, but the maintenance of your home environment can also play a part in your overall mental health. A disorganised home can impact your mood and how you feel about yourself. Studies in the past including one by UCLA researchers have repeatedly established a link between clutter and mental conditions such as stress, anxiety, and depression. In 2016, comparethemarket.com found that the UK hoards the most clutter across Europe. One in two British people admitted to holding onto stuff longer than they should. Women seemed to be more affected by the relationship between a tidy environment and stress levels, according to a University of California study. Overall, 85 percent of adults in the UK were regularly stressed as of January 2018. With a tidier home, you are shown to feel more relaxed and make better food choices. Both of these are irrevocably linked to mental health and self-esteem. An unclean home also means that physically, both you and your family (particularly children) are increasingly exposed to toxic fungi making you prone to immune reactions such as asthma. A cleaner home can also boost your energy levels. People with tidier home environments reported that they got better sleep; a key influencer of your energy levels. In 2011, the National Sleep Foundation confirmed this link in a study where three-fourths of the participants said a clean, quiet room was important for their sleep. A better night sleep acts as a restorative to your body functions. Depression has also been linked to fatigue and the sleep quality which forms an indirect connection between depression and a clean home. Organisation in the home and the workplace helps to channel focus and concentration. Productivity rises in environments that are not cluttered or messy due to the increased ease of performing the tasks needed. This has been applied and proven in the workplace by multiple researchers and the same premise applies at home. A messy environment can increase the time taken to perform simple tasks, remained focused and negatively affect your stress levels. The Centre for Facilities Research released a study showing 88 percent of its participants found a messy environment to be a distraction while order promoted concentration and learning. Having a clean house does more than help you feel accomplished and happy. It supports your physical health by reducing your chances for illnesses including allergic reactions and asthmatic flare-ups. It also reduces stress, fatigue and promotes better mental health all around. Sometimes, we don’t even realise how demanding our jobs are, but the 9-5 working routine takes a toll on both your mind and body. In today’s society, a job is often more than a way of earning money. It’s a part of our identity and sometimes even a lifestyle of its own. This means that many of us will end up doing more hours that we’re contracted to, just in an effort to do our jobs well. In the UK, more than 5.3 million people do an average of 7.7 hours unpaid overtime every single week. Whilst chasing professional success is an admirable thing, it shouldn’t come at the expense of your physical and mental health. If you’ve been feeling consistently ill or stressed, your work could be to blame. The majority of us work in desk-based jobs, which don’t exactly seem like dangerous environments to be in. However, working 10 years in a sedentary role can actually double your risk of getting colon cancer. In some workplaces, staff might be exposed to toxic chemicals on a regular basis. In some professions, like dentistry and radiology, physical health risks like this cannot be avoided. However, it’s important that employees are able to properly protect themselves from risks like this and also take breaks when they need to. In other professions such as lorry driving, expose to toxic chemicals is not generally expected. However, bladder and lung cancers are more prevalent in drivers because of the toxic chemicals in car materials. Health issues caused by work can usually be solved by having a good work-life balance. Having sufficient time outside of work to look after ourselves whether that’s by getting enough rest, exercising or socialising, is crucial to our performance at work. There are even studies that have shown that happy employees are 20% more productive than unhappy employees. It’s in the interest of everyone that employees get enough time outside of their jobs. With our thanks to Katie Myers who writes for Stanley R Harris.. Katie created this infographic and wrote the introduction above. This infographic from the team at Stanley R Harris looks at the physical and mental health risks commonly faced in different professions. Hopefully, it will encourage people to prioritise their health when they need to. Whilst pursuing a successful career can be great for your personal fulfilment, it’s important for your physical and mental health to take time outside of working hours to properly recuperate – doing so will benefit both your health and your career. In Part Four of Ivan Barry’s audio presentation about hearing voices, entitled “Flames, Flashes and Voices in the Sky”, Ivan considers voice hearing in the Old and New Testaments. Characters in this talk include Abraham, Moses, Isaiah, Jesus, Saul and Ananias.